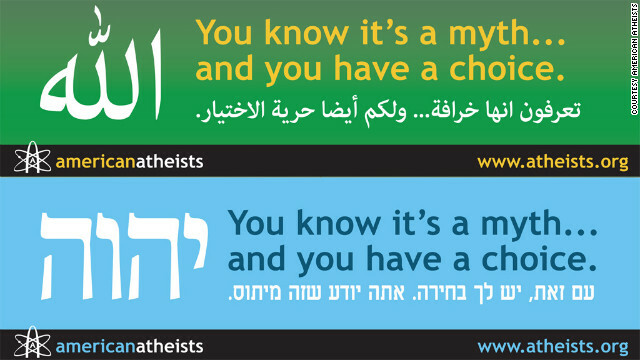 The American Atheists' president acknowledges that the pair of new billboards will likely cause a stir. Silverman says the signs advertise the American Atheists’ upcoming convention and an atheist rally, called the Reason Rally, in Washington next month. Atheists have long pointed to surveys that suggest atheists and agnostics make up between 3% and 4% of the U.S. population. That number increases when Americans unaffiliated with any religion are included. The Pew Center’s U.S. Religious Landscape Survey found that 16% are unaffiliated, though only a fraction of those are avowed atheists and agnostics. Silverman acknowledges that the pair of new billboards will likely cause a stir. The billboards will be up for one month and cost American Atheists, based in New Jersey, less than $15,000 each, according to Silverman. Mohamed Elfilali, executive director of the Islamic Center of Passaic County, laughed when he learned the Arabic billboard would go up in the same town as his office. He says he’s surprised that someone is spending money on such a sign. But Elfilali bemoaned the billboards as another example of a hyper-polarized world. The Brooklyn billboard is likely to raise eyebrows among Jews, in part because Orthodox Jews don't write out the name of God, as the billboard does. Rabbi Serge Lippe of the Brooklyn Heights Synagogue was more dismissive than outraged about the billboards. But Lippe acknowledged that there are a lot of agnostic and atheist Jews. A recent Gallup survey found 53% of Jews identified as nonreligious. Among American Jews, 17% identified as very religious and 30% identified as moderately religious. “When you have two Jews in the room, you have three opinions,” joked Lippe. At the time, the American Atheists said the billboard was to encourage Atheists to come out of the closet with their beliefs and to dispel the myth that Christianity owns the solstice season. The Christmas billboard led to a “counter punch” by the Catholic League, a New York-based Catholic advocacy group. The Catholic League put up a competing billboard that said, “You Know It's Real: This Season Celebrate Jesus." Silverman says his group’s billboard campaigns will continue long into the future. Woopty doo. Someone knows the word "myth". They've proved absolutely, positively nothing. or "Behold the hand that was nailed [to the cross]"
"You know it's a myth...and you have a choice" Yeah, you have the choice to go to hell or not. I choose not, thank you. I do not think that we have to fight about the extistence of God.We have so many issue to take care of.I personaly believe in God who asks us to be good and love all humans.If we,humains had been good with straight conduct,we would not have needed prophets nor religions.The humans themselves altered everythings by politizing religions to serve their own interests and get more power.All three monotheist religions are the same but humans rewrote the Books in a way to make them become conflicting and different. I agree with you Mike man has made God into his own IMAGE! Ha, it's good to see the Catholics have a sense of humour! But yeah, I'm atheist, but I don't go around bashing other people. If you believe in something, more power to you. But what I can't stand is when people push their belief on others, regardless of what it is. The American Atheists just bring the rest of us a bad name. eulogy1337- how do you claim God doesnt exist? No one can disprove Jesus, the prophesies before him about him- and everything he did. People were killed and torutiured after his ascension spreading the word as he told them. His ressurection was the foundation of Christianity. Again this all comes down to you, and many like you think you know better than God. I am someone who believes, and I know I will be judged harshly for being a sinner. You understand therefore considerably relating to this topic, made me personally believe it from numerous varied angles. Its like men and women don't seem to be interested unless it's something to do with Girl gaga! Your personal stuffs nice. At all times maintain it up! Atheists are the most disrespectful and arrogant people ever ! It's because we don't see anything worthy of being respected. What is respect-worthy of believing in something that has no good evidence? And I do mean religion, not people who happen to be religious. Religion, minus people, is disgusting. It attempts to enforce a closed system of thought, that must reject conflicting claims regardless of which is the more logical conclusion – if it simply accepted evidence when it was due, it would lose all credibility, because the "word of God" cannot be considered fallible. This is prime irrationality, and irrationality coupled with voluntary ignorance is the root of most evil. You perpetuate the idea that faith is a virtue, which provides justification for extremists. You tell people that God can talk to you, when there isn't really any god that is talking to them. Stress can cause invasive thought, and since it is so out of the blue, could it be mistaken for God's voice, in the mind of the convinced? Dogmatic belief, that is, a system of ideas that demand to not be challenged – how can you not see the harm in that? If I had absolute PROOF that your God didn't exist, you'd completely ignore it! How can this be regarded as a good thing, that you disregard new information on emotional grounds rather than logical? How can we continue to progress if conflicting evidence can't be accepted simply because it is conflicting with your beliefs? What is the difference between a religion, and a cult? Nothing, except for in some definitions of 'cults', they simply have less mind-slaves. I'm sorry if I come off as arrogant, but if you were an atheist you'd understand. When 99% of the people around you are delusional, and you understand why they are delusional, it can be really depressing. Sometimes, I feel like the only sober person in a car full of drunks, that refuse to let me drive. I believe in God but your statement is not true The FUNDEMENTALIST INTOLLARANT Christians are just as BAD!